Early in my marriage, I really had little idea just how much I influenced my home and family. I was so focused on trying to control everything and everyone. I had my routines and organizational systems in place that everyone was expected to follow. These things were only superficial ways that I was trying to control my home, but it did little to help me create the type of atmosphere in my home I really wanted. My heart desired a God-centered home where there was love and peace. Yet, my fussing because the house wasn’t neat and my nagging that they didn’t get things done by my time table was getting in the way for what I really wanted. My husband and sons deserved more. Actually, so did I. I wanted to live free of feeling that I needed to control every little thing in my home in order to be happy. I wasn’t happy. I was exhausted, and, at times, just not fun to be around. Going to God, I prayed to learn a new way to build my home. I needed God to show me how to build a home that honored Him in everything, which included my words, my attitude and my heart. According to Webster dictionary, atmosphere is the surrounding influence or environment. The atmosphere of our home influences the relationships we develop with our spouse and with our children. If we, as wives and/or mothers, create an environment of contention, strife, and discord, then our relationships are negatively impacted. If we seek to develop healthy, thriving, Godly relationships, then how we steward our home environment is vital. 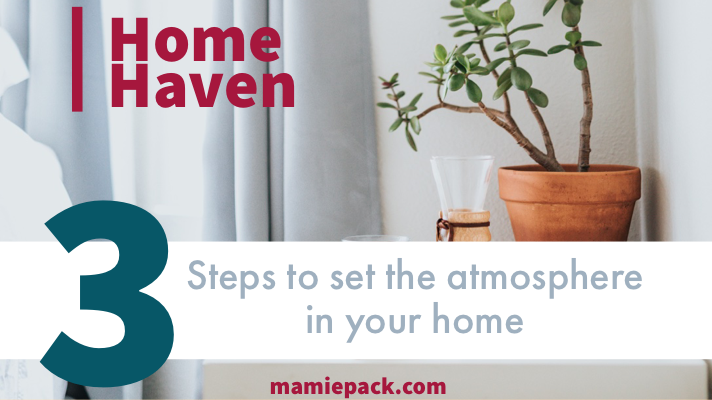 Today, I discuss how I include three steps to set the atmosphere in my home to cultivate love and peace. Take a look below. How do you set the atmosphere in your home? I would love to hear. Leave a comment below. This was awesome! I’ve been married for almost 4 years and I’m currently making the marital mistakes you mention in this video. I’m going to start implementing the wisdom God have you. Thank you for this! I love hearing that! We gotta help each other out. I provide a loving and learning atmosphere in my home. With two little boys they need to feel love no matter what even when we are scolding them for trying to teach them right from wrong. Absolutely Mira! Love is so essential! Thanks for sharing these helpful tips! It’s hard sometimes to create a positive and warm atmosphere in the home, with the outside factors that affect us. I will definitely try to implement these ideas with my husband and son in our home. I glad to hear they were helpful. Don’t feel like you have to implement them all at once, but maybe one that stuck out to you. Thanks Ashley! It has made such a difference. This is such a lovely lesson for us all. I have tried changing my language from “house” to “home”. I also pray often and try to create a cooperative, fun and engaging environment. Thank you for reminding us that our homes should honor God and to count our blessings! Yay!! That is great. Every step makes a big difference. Thanks for the reminder! I’m a ‘yeller’ and that’s not really good when it comes to setting a peaceful atmosphere at home let alone setting a good example for the kids. Really needing to work on this. Oh, been there and still have some moments. But the more we change our hearts and tones it positively impacts our homes. It’s funny how children can change your entire world.